Induction Cooktop Hall of Fame! - Are Induction Cooktops Safe? - Are Induction Cooktops Easy to Use? - What Are the Best Induction Cooktop Brands? - Do Induction Cooktops Magnetize Food? What Is An Induction Hot Plate? Induction cooking uses a magnetic field to direct precisely the right amount of heat for the size of pan you're using - there's no heating element. This means that an induction cooktop can usually cook food faster then even the best gas stove. Hot plates are often portable, and able to be used both inside and out, making an induction burner ideal for parties, as well as a must-have for those with small spaces. Induction cooktops don't work with all kinds of cookware, however: the cookware needs to be magnetic, in order for the magnetic field of the burner to function through the ceramic glass surface. Also, it is worth bearing in mind that induction hot plates become very hot, very quickly, and the focused nature of their heat direction means that non-stick coatings don't often survive an encounter! Finally, but most importantly, induction cooktops are not recommended for people who have a pacemaker fitted, so please do bear this in mind before frying or boiling your first egg. Who Needs An Induction Hot Plate? As they take up very little counter space, induction cooktops are ideal for people living in small apartments, or those in a house share situation. They are also a good investment for those who regularly cook for formal dinner parties, for example, as they provide additional stove-top space. This means multiple dishes and accompaniments can be cooked at the same time, ensuring a perfect, tasty, and timely end result. At house parties, induction burners are useful for keeping potluck dishes such as chili hot, while your guests enjoy themselves. 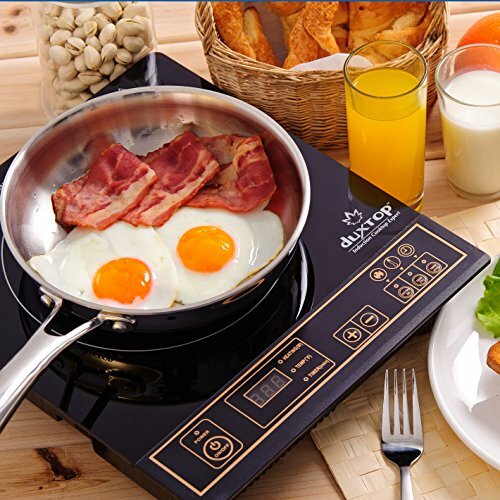 Induction hot plates are also a good investment for individuals concerned about their carbon footprint, as they are 90% energy efficient. This means that only 10% of the total energy used is “wasted” energy, which is dispersed into the atmosphere. The rest goes directly to the core function of the hot plate. Where Can An Induction Hot Plate Be Used? Pretty much anywhere, indoors or out. Most induction cooktops are portable, and so are ideal for bringing out onto the deck when you have friends over. Their small size also makes them ideal for small kitchens, and for use in an RV or trailer. The Secura 8100MC is portable, easy to clean, and suitable for indoor or outdoor use. It comes in a choice of stylish black or luxury gold, and has a digital control panel for ease of use. A sophisticated centerpiece at parties, the Secura looks just as good on your decking as it does on your kitchen counter. The cooking spot automatically adjusts to the size of your pan, to provide direct, efficient cooking heat. The Secura has been noted as being somewhat inaccurate at low temperatures, which is its only drawback. If you are just using it for general purpose cooking, the accuracy issues may not be much of a problem, although it may well be a significant drawback for those who do a lot of cooking. Presented in a range of colors to match any kitchen décor, the NuWave Pro 1800 comes complete with a practical carry case, and a users' manual which includes sixty recipe suggestions. 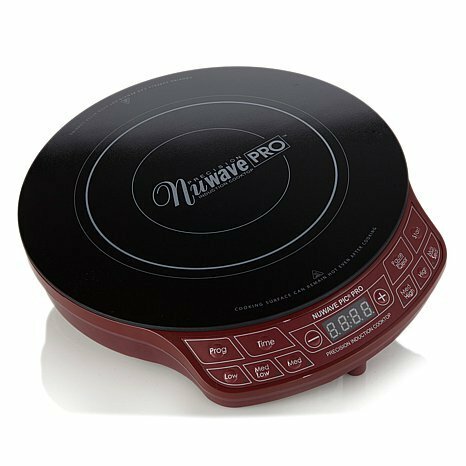 The NuWave offers the ability to pre-set a temperature: ideal if you want to be able to pop your pan straight on the stove when you come in from a day's work and have your meal ready in minutes. However, some people have experienced issues with the NuWave not holding the pre-set temperature. Another drawback is that, as the NuWave is slightly slanted, pans can easily slide around on its surface. This is particularly an issue when cooking dishes that require vigorous stirring. Often, the only solution is to hold the pan with one hand, whilst stirring with the other. As induction burners do run at quite high temperatures, this is obviously somewhat uncomfortable, and, in some cases, dangerous. The ID1-350, from Salton, features an easy to read LED display. The ID1-350 is portable, and suitable for both indoor and outdoor use, making it ideal for parties, and an essential addition to any RV road trip. The ID1-350 offers an excellent introduction to the benefits of using an induction hotplate. It would make an ideal gift for someone who has just moved into their first apartment, or a college student looking for quick, easy, yet healthy cooking. The Induxpert is lightweight and portable, and benefits from the additional safety feature of a child lock. If you have young children who might be able to reach countertops, this feature of the Induxpert provides peace of mind that they won't accidentally turn the unit on and injure themselves. The Induxpert comes in a stylish design, with sensor-touch control for complete ease of use. This induction hot plate can run quite loudly, which some people (i.e. me) might find irritating. There have also been concerns raised about its long-term durability, although, sadly, the days of any appliance or product lasting ten years or more seem to be long gone. The Induxpert would be an ideal purchase for someone who likes to entertain. If you're keen to be seen as cool and contemporary, then the Induxpert may just be the kitchen accessory for you. 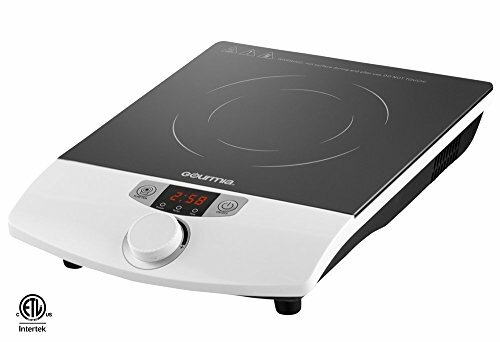 Finally, the Gourmia GIC-100 offers everything you would expect from a good, basic induction hot plate. However, it does take a while to lose heat once it has been switched off. As with other induction cooktops, pans move around too easily on the Gourmia's surface, which some people find somewhat off-putting. It is also less intuitive to use than other models, and the instructions provided are somewhat unclear. While induction hot plates are a relative newcomer to the personal kitchen realm, the overwhelming consensus is that to try them once is to be converted! They are particularly good when it comes to cooking stir fry, as they get the oil very hot, very quickly, allowing the ingredients to simply be tossed through, as they should be. Even on the best gas stoves, a stir fry takes far longer than it is traditionally meant to. This is most definitely not the case with an induction hot plate. Hot plates, or induction cooktops, use electromagnetic induction. Gas and electric griddles use thermal conduction. The heat generated using electromagnetic induction versus thermal conduction results in two key factors. How much heat is being generated and how much of that heat is actually cooking the food? When using gas or electric burners, the stovetop itself must be heated, and that heat makes the cookware set on it heat up. Induction burners create a magnetic field that only generates heat within magnetized cookware set on top. This means the surface will get warm from the cookware, not the other way around, and the surrounding air doesn’t heat up, keeping the cooking area cooler. Because the heat generated comes directly from the cookware, induction burners typically get cookware hotter faster. This means you get boiled water quicker and mealtimes prepared sooner compared to convection heaters. Gas burners, while useful, have two immediate dangers when starting: the release of gas and a flame to ignite the gas. Eliminating those two factors lead to the rise of electric burners that offer flat surfaces, but this can lead to higher electricity costs for frequent cookers. Both gas and electric burners mostly use low/high controls, but induction cooktops typically have digital temperature control panels, mostly ranging from 100 – 460 degrees, allowing for a precise temperature setting, like an oven. 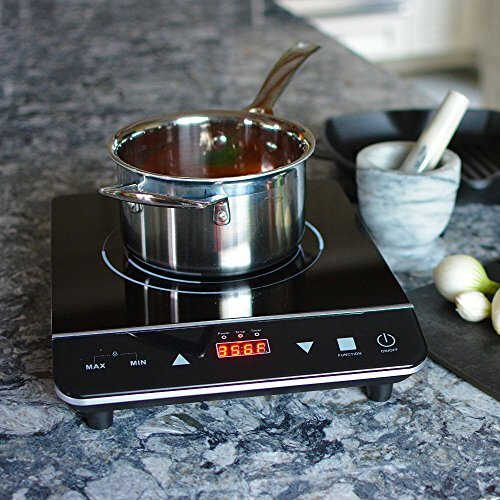 After cooking with the induction burners a few times, most users recognize the best temperature settings for their needs, resulting in a better quality meal in less time than gas or electric cooktops. Portability and digital controls make induction cooktops a great option for families with children, as safety and overheating controls are built-in to most models. Homes of all sizes often come with built-in gas or electric stovetops, unless you’re moving in to a brand new home. Buying an extra cooktop may not seem practical, especially if you need to buy compatible cookware. If you don’t want to buy compatible cookware, an induction interface disk can be bought as a bridge of sorts between the induction cooktop and the cookware, but these often create a lesser quality of cooking and costing about the same as a new cookware set. The cooking itself with induction cooktops is great over the coil inside the cooktop, but the food in the pan not located directly over the coil may not see the same finished results. Since electromagnetic fields are being produced with induction cooktops, it’s recommended that people with pacemakers consult with their doctors before use as a precaution. This electromagnetic field can also produce a buzzing of various audible strengths depending on how long and how high the field has been generated. It’s also recommended to use induction burners away from any devices with wavelengths that may interfere with the cooktop's effectiveness. This includes televisions, cell phones, and radios. Considering most of these devices are in or near where induction cooktops would be used, many people should question if this would affect their cooking. When keeping induction cooktops safely 4-6 inches away from other objects and not placing other magnetic items on them, induction cooktops are considered safer than gas or electric burners. Heat is only generated in the cookware itself as a result of the magnetic field interaction. However, gas and electric burners generate heat themselves, transferring that heat to the cookware and surrounding air. As these cooktops aren't built in to your home, rubber feet to keep them sturdy while cooking is essential. If you come across a model that doesn't have rubber feet, which is rare, you'll want to buy something to safely set your cooktop on so it doesn't move while cooking. Most induction cooktops come integrated with sensors for when cookware is removed, so it shuts off automatically after a few seconds or makes loud beeping sounds. Note that you can use cast iron skillets, black metal pots and pans, and the like on induction cookers. Are Induction Cooktops Easy to Use? Most people are familiar with using gas or electric burners, and not all induction cooktops have settings based on low and high. Some cooktops have specific temperature settings, but most will come with a handy comparison guide for when you’re learning which temperatures provide the same results as conventional low/high options. After a few cooking achievements, using induction cooktops are considered just as easy as gas or electric burners. Induction cooktops also provide easier cleaning considering most have a flat top that can easily be wiped down, as opposed to grooved surfaces capturing various food and grime. Whether you choose a single burner or dual burner induction cooktop, the ease-of-use will remain the same. 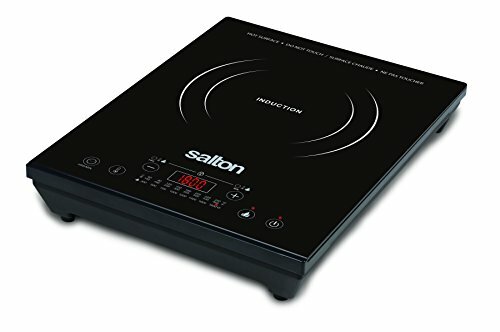 What Are the Best Induction Cooktop Brands? For restaurants, the Breville and PolyScience brand offers top-of-the-line solutions for induction cooking, including their Control Freak model. Using intuitive user-friendly control panels and offering more bells and whistles than your at-home models, this brand will keep businesses ahead of the competition. The at-home brands showing the most promise among wide testing audiences is Secura, with the Duxtop models, and Max Burton, both offering one year warranties. If you’re willing to save some money and take a chance on a brand with no warranty, Avantco is worth considering. When comparing brands, these offered the most control options and features. Power and temperature controls, pan-detection in case of incompatible cookware, and time options to remain on longer than a few seconds when removing cookware are standard in these brands. Do Induction Cooktops Magnetize Food? An induction burner has a magnetic wire coil below the ceramic top, and when you run electricity through that coil, a magnetic field facing upwards is created. This magnetic field only affects iron put in its path. Iron and magnetic stainless steel are poor electrical conductors, which prevent electricity from traveling through the object freely, trapping it in the metal and generating heat as a result. Electricity passes through everything all the time, but it’s only in high doses that it can be dangerous. As long as the food you’re cooking contains no metal, which should be expected, you can rest assured that it will be safe to eat. Are Induction Hotplates Very Fragile? Not especially, though ceramics and glass can of course fracture if something heavy is dropped onto them. There's also some risk of scratching.